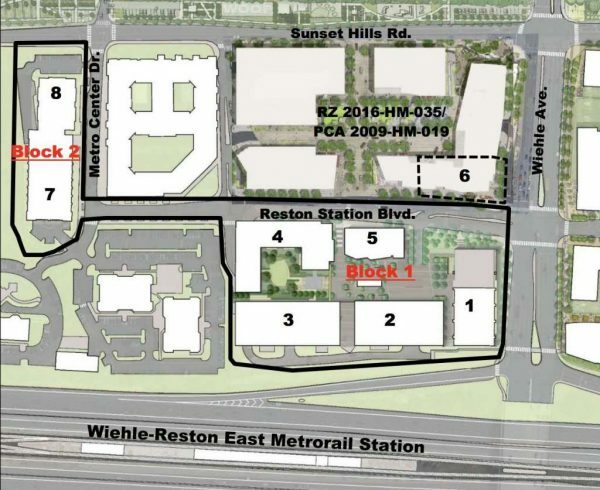 Expanded plans for Comstock’s massive Reston Station development were approved by the Fairfax County Planning Commission Thursday night. The latest plans add an additional 362,450 square feet to the mixed used development, bringing the total to 1.7 million square feet and adding 155 additional residential units. Reston Station (1866 Metro Center Drive) includes a mix of residential buildings, retail, restaurants and hotels. The project is located on the south side of Reston Station boulevard, west of Wiehle Avenue. The commission also approved plans to increase the height of building four from 205 to 225 feet and building seven from 140 to 280 feet. A hotel option was added to building seven. The amended plans head to the Fairfax County Board of Supervisors on Tuesday (April 10) for final consideration. A map of the buildings is below.